British Prime Minister Theresa May (left), U.S. President Donald Trump (center), and Chinese President Xi Jinping (right), at the first session of the G20 summit in Hamburg, Germany, July 7, 2017. Dhruva Jaishankar is a Fellow in Foreign Policy at Brookings India in New Delhi. After nine months of relative ad hockery on Asia, the Trump Administration is zeroing in on a regional strategy centered on the pursuit and preservation of a “free and open Indo-Pacific region.” Notably, the phrase, which appeared in the White House official announcement of the president’s trip, was further developed two days later in a speech by Secretary Tillerson, and will reportedly feature prominently in Trump’s address at the APEC CEO Summit in Da Nang, Vietnam. What is striking, however, is the degree to which Trump’s China policy to date has been nearly opposite of what would be required for a strategy dedicated to a “free and open Indo-Pacific” narrowly focused on North Korea and trade, rather than holistic and comprehensive; explicitly transactional rather than based on deeply-rooted principles and values; rejecting multilateralism, rather than supporting regional institutions and collective action; emphasizing “America First” rather than American leadership; and being forgiving—even flattering—of China and Xi Jinping, rather than reflecting the emergent ideological competition. In the wake of the Administration’s conspicuous “Indo-Pacific” rollout, this begs the question of whether Trump’s upcoming trip to Beijing will represent a turning point in U.S. China policy or U.S.-China relations. Will there be any evidence in Beijing of a strategic shift in Washington? Don’t count on it. The visit will be long on ceremony and short on substance. Trump isn’t interested in playing hardball with his host in public. And while the Administration will put down markers privately on areas of frustration and disappointment, it isn’t using the visit as a forcing function or negotiating session. Instead, Air Force One will depart for Vietnam with little changed and little achieved. Trump’s time in Asia will only amplify his Janus-faced approach to China. The China visit will be all smiles, bookended by pronouncements about a new strategy that implies a harder line toward Beijing. My bet is the tougher policy will clearly emerge and ultimately win out in the coming months, but we’ll see little evidence of that while Trump is on the ground in China. In that sense, Trump’s visit to Beijing will be “historic,” as the Chinese are billing it, only in its peculiar irrelevance to the future direction of U.S. China policy. China’s strategy will be to roll out the red carpet for President Trump and to show him great respect, while offering little or nothing in the trade arena. Economists generally do not care about bilateral imbalances, but Trump has made a big deal of the U.S. bilateral deficit with China. The deficit has grown 6 percent this year and will continue to rise, especially if there is a tax cut. The real issue for U.S.-China is not the bilateral imbalance but rather China’s market access restrictions. Important products such as autos face a 25 percent import tariff. More important are the investment restrictions in a wide range of manufacturing and services industries. In services in particular, it is difficult for U.S. firms to sell into the China market if they cannot invest there. Firms are limited by restrictions in finance, telecom, logistics, entertainment, and social media. The state visit to China comes at an inopportune time, too soon after the 19th Party Congress for China to have any significant opening moves in the works. President Xi will tell Trump that China is planning to open up more sectors, but there are unlikely to be any details or commitments. Best case is that China is ready to open a couple of markets such as investment banking and insurance as a signal that it is serious. The timing of the visit is also inopportune in the sense that the U.S. is carrying out a major 301 investigation of unfair trade practices. Some months down the road, the administration will have the results. China is unlikely to make any major changes in response to the investigation. Chinese exports to the U.S., in value added terms, have declined to about 3 percent of its economy, from 6 percent just a few years ago. Access to the U.S. market is useful for China but not as important as in the past. Hence, China is unlikely to give in to threats. The administration will then have to decide if it wants to take some tough protectionist measures, to which China is likely to respond. China is betting that keeping up the friendly talk will reduce the likelihood of harsh U.S. protection down the road. China is also lining up a set of import and investment deals. In general, these transactions were going to happen anyway and do not signify a shift in Chinese policy. But the administration may be happy to showcase some of them as evidence that the relationship is improving. Trump will continue on from China to the APEC meeting in Vietnam where he will give a speech on the free and open Indo-Pacific Region. The TPP11 may be prepared to announce a trade agreement in principle without the U.S. China will no doubt reiterate its vast financial commitment to building infrastructure along the Belt and Road. There is a risk that the U.S. has nothing of substance to contribute to the economic architecture of the Asia-Pacific. I very much appreciate Dhruva’s enumeration of the encouraging aspects of the Trump administration’s Asia policy. I am less convinced that this represents a solid policy grounding after months of trial and error. “Trial and error” suggests an empirical process in which an individual or a group is actually learning and assimilating evidence. There are intermittent indications that such things might be happening. But the very large possibility that this impression is mass pareidolia—the tendency of, in this case, policy observers to see what they want to see in the chaos of meaningless phenomena—is always present. The credible appointments made to the state department are perhaps counterbalanced by the President’s recent reckless remarks about North Korea and Pakistan, his apparent lack of interest in resolving what are still pressing issues relating to the South China Sea, his unthinking encouragement of the destructive actions of the government of the Philippines. The hot and cold demeanor with respect to China is also troubling. Clearly, Donald Trump appreciates Xi Jinping’s authoritarian successes; but China is likely to be the scapegoat again if explanations have to be made for weakness in the U.S. economy. Anything the President may suggest or promise cannot be followed up: the State Department is still too thin on the ground to provide local continuity with any new or renewed understanding. And the President has shown an unfortunate willingness to neutralize the words and efforts of the Secretary of State. The greatest destabilizing factor of course is that Asian leaders are confronted with the challenge not only of wondering when the President’s moods will change, but when the presidency itself will change hands. Even if the current President remains in office through the end of 2018, the signs are everywhere that both political parties and most of the professional bureaucracy are learning the necessary skills to isolate the integrity of domestic government from the storms of the President’s moods and unapologetic self-interest, and this could ultimately extend to foreign policy —a foreign policy controlled by Congressional parties or by the military. On those grounds alone, no foreign leader can take seriously much of what the President or the Secretary of State says. This is happening at a moment when precisely the opposite is true of China. Xi Jinping has not only consolidated his power to a degree that is unprecedented since the period of Deng Xiaoping, but he has installed himself as part of the superstructure of contemporary Chinese government, in many ways transcending the Party and the transience of his own tenure as General Secretary and President. Xi is manifestly the opposite of Trump in terms of durability, predictability and reliability. It is certainly possible, though not likely, that this tour will produce a few moments of charm and optimism. Unfortunately no Asian leaders will credit anything good seeming to come from the President himself or from those he has the power to undermine. The randomness of American policy pronouncements will continue until the other branches of government take steps to protect our policies from the current incumbent. During President Trump’s trip to Asia, one word he might say a lot is “Indo-Pacific,” in contrast to “Asia-Pacific”, frequently used by his predecessor Barack Obama. The goal, as seen by many pundits in Washington, is to draw India into a U.S. alliance to counter China’s growing influence in the region. The motivation was evident when Secretary of State Rex Tillerson spoke on Oct 18 at the Center for Strategic and International Studies, touting India and berating China. Tillerson seems to believe that given the border standoff between China and India this summer, India would be more than happy to be a U.S. puppet in the region to counter China. What Tillerson may not know is that the countries in the region have long made it clear they don’t want to be forced to choose between China and the U.S.
Tillerson’s words indeed came as a surprise because it was he who endorsed the new type of major country relationship during his visit to China in March. Although his words triggered a backlash at home, they reflected his positive view of future China-U.S. relations. In that sense, Tillerson’s words were both confusing and contradictory. So I consulted Stapleton Roy, who served as U.S. ambassador to China, Singapore and Indonesia. Roy, a career diplomat, believes that one principal rule of foreign affairs is that when the U.S. talks about India, it should never mention China. Otherwise, India will resent the U.S. because it doesn’t want to be used against China. A Brookings India survey several months ago showed that while Indians are wary of a rising China, they also believe that ties with China must be improved. For years, countries in the region have been moving toward closer integration rather than disintegration. For example, China’s Belt and Road Initiative (BRI) and the Asian Infrastructure Investment Bank (AIIB) have become a boon for the countries in the region looking to improve infrastructure and connectivity. China and India also have strengthened ties despite their unresolved border disputes. The two countries are key members of the BRICS. Just in September, Indian Prime Minister Narendra Modi attended the BRICS leaders meeting in Hangzhou. At the Shanghai Cooperation Organization (SCO) meeting in Astana, Kazakhstan, in June, India and Pakistan became full members of the organization. China is now India’s largest trade partner. More Chinese companies, such as Huawei, ZTE, Alibaba and Xiaomi, have invested in India, while more Indian companies, especially in software and IT services companies, have invested in China. The potential for win-win cooperation between the world’s two most populous nations is enormous, and there is no reason for them at all to engage in a zero-sum game. It is entirely OK for the U.S. to propose an Indo-Pacific strategy. However, such a strategy should not aim at a third country, such as China. And it would serve the U.S.’ interests best if its strategy is to unite all the countries in the region rather than try to divide them. It was always a legitimately contested item in American China policy, believed by some to be a sentimental distraction from the realpolitikal pursuit of our interests, embraced by others as a necessary expression of American values—either way, human rights has dropped away from the American discourse on China and as a goal to pursue. 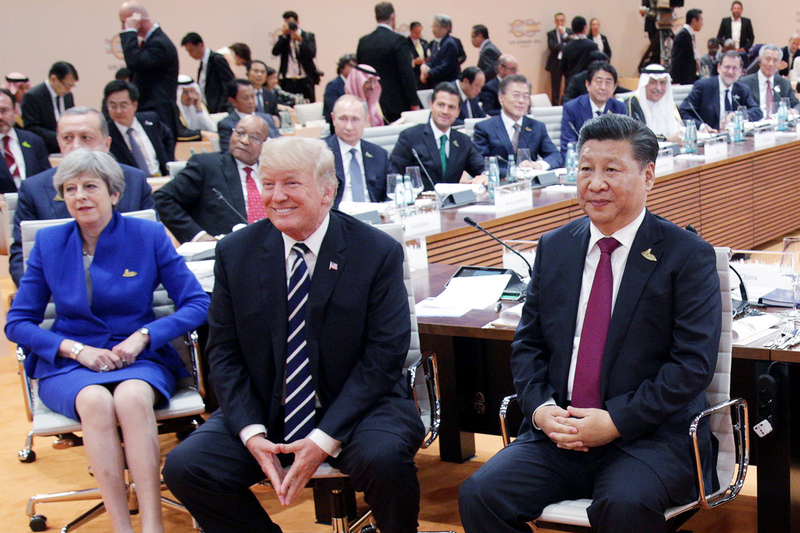 That’s probably not surprising, given Donald Trump’s soft spot for dictators, Vladimir Putin being exhibit number one here, with Xi Jinping, that “great guy” in Trump’s eloquent phrase, rapidly gaining in the presidential estimation. It’s hard to tell what the view of this is among the more competent of Trump Administration officials, like Mattis and McMaster. Whatever their views may be, they haven’t been publicly articulated. It’s worth noting in this sense that ultimately the contest between China and the United States is one of values. The China challenge gets its importance from China’s emergence as a force for explicitly, even legally enshrined anti-liberal and anti-democratic practices and ideas. That’s what Xi Jinping was talking about in his speech at the 19th party Congress, when he evoked Socialism with Chinese characteristics as a “new option for other countries.” It’s what was meant by Document 9, the Central Committee directive against such “Western values” as a free press, an independent judiciary, and what it called “historical nihilism”—meaning truthful history. We do need to remember that Socialism with Chinese characteristics is a euphemism for one-party rule, pervasive censorship, the imprisonment of dissidents, and the subjugation of the judicial and media machinery to the dictates of the Communist Party. It’s the eradication of the idea of truth as something independent of political power. Human rights has so dropped from the discourse on China that it feels almost quaint to bring it up, and, anyway, it seems highly unlikely that Trump will bring it up. It would spoil the red carpet atmosphere that China is preparing for him. But is American policy in Asia really only about sanctions on North Korea and better trade terms? Again, it feels almost mawkish to evoke the notion that the advancement of freedom the ultimate American interest in the world. China opposes freedom. That’s the basic divide between the two countries, not the export of Chinese aluminum foil to the U.S. or the business that Chinese banks do with North Korea. Trump ought to enunciate American values while he’s in China, but he won’t. President Trump came into office with a much clearer picture of how the region fit into his overall vision on trade and economics than on security. Ironically, he’s far more likely to make genuine progress on the latter than the former during his trip to Asia. President Trump’s original focus was to have America’s allies spend more on their own defense in return for continued American protection, but he’s relatively quickly reverted to a more traditional security posture rooted in a sustained presence for the U.S. in the region and strong partnerships with its allies, largely because of the immediate risks posed by North Korea’s nuclear program. He’s situated this approach within the organizing concept of a “free and open Indo-Pacific.” The biggest challenge—on this trip and beyond—will be resolving the contradiction between balancing against Chinese expansionism and enticing China to collaborate on the Korean peninsula. One should expect a consistent drumbeat on North Korea during the trip, and he’s likely to hear a largely positive response at almost every stop, save for concerns, perhaps most strongly made in Seoul, about the dangers of pushing too hard. By contrast, he’s likely to run into far more resistance on his trade agenda. The administration has articulated a vision in which the United States has suffered tremendously as a result of unfair trade deals regionally and globally, reflected in persistent bilateral trade deficits. Trump has taken several steps to re-set the relationship with the region, including famously withdrawing from the Trans-Pacific Partnership on his third day in office, seeking a new bilateral agreement with Japan, renegotiating the Korea-U.S. Free Trade Agreement (KORUS), initiating several investigations on Chinese trade practices, and hinting the US could withdraw from the World Trade Organization. The trip comes at an awkward time to further this agenda. Each of the leaders he will meet in Japan, South Korea and China are in strong political positions and have domestic support to resist American pressure. At the same time, President Trump is not ready to turn up the heat on any of these countries. He not only needs everyone’s help on North Korea, but the investigations against China are still far from complete, so he doesn’t yet have the tools in hand to penalize China even if he would want to. As a result, President Trump is likely to privately push for his revised agreements, but publicly be far more accommodating. The Beijing leg will feature the announcement of a large number of trade and investment deals, which will add up to a large number preceded by a “b,” as in billions of U.S. dollars, but not place any constraints on Chinese industrial policy. The danger is that the deals with be trumpeted as such a breakthrough – in order to win praise from his base – that he will undercut the argument and support for future pressure down the road. The most awkward moment on trade will come in Da Nang, Vietnam, at the APEC leaders meeting, when the President will come face to face with most of the other members of TPP, who were left at the altar, and who may also be ready to announce the completion of negotiations for a TPP-11 – without the United States. In sum, the trip is likely to highlight the gap between economic and security ties. And as we know, a sustained American security presence rooted in strong partnerships in the region must be built on the foundation of strong and vibrant economic ties. Assuming that the top priority of the POTUS is to be re-elected, the main purpose of his Asia tour is to be seen by American voters as creating jobs. To that end he supports a free and open Indo-Pacific, one not dominated by the C.C.P. state. Nations of the Indo-Pacific are expected to beef up their security by buying expensive weapons made in the U.S.A. This is supposed to be seen at home as creating American jobs and reducing the trade imbalances.